This game is based on the rocking out tunes of Big Time Rush.It is a rhythm enriched game that is easy to use for all ages. My 5 year old could learn it and play it easily in the first day, yet it was exciting enough for the 13 year old to play. Those are the type of games I love, something for everyone! We were not familiar with this band prior to reviewing this game. We found the songs to be really catchy and have a fun beat to play on the touch screen. You get to work on your rhythm while learning new songs. It is a nice family friendly game! 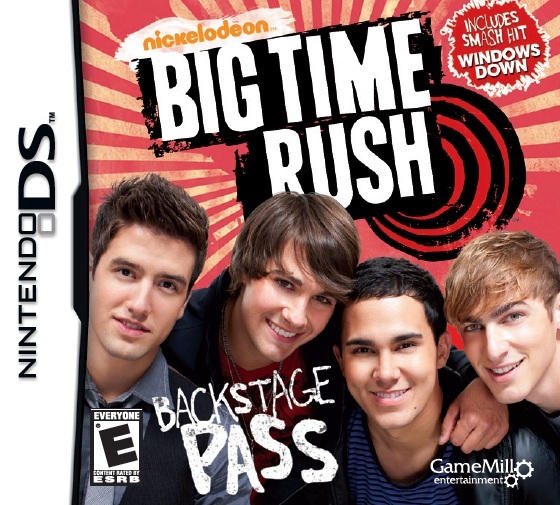 Big Time Rush: Backstage Pass (Nintendo DS™) offers on-the-go fun, featuring songs that include fan favorites such as “Windows Down,” “Til I Forget About You,” and “Boyfriend.” Players follow along to the beat of the selected tracks, using the touch screen to tap, hold, drag and scribble on cue to earn maximum points. Fans can watch music-style videos to see behind-the-scenes views of the band in action from on stage to the tour bus and more. I received a copy of this game in exchange for an honest review. Pick up a copy today for all of your Game loving kids this holiday season!